PLEASE NOTE: These images are shared for historical interest and research purposes. They are not to be used for any other purpose, public or personal, without specific written permission. The display rack above, with detail images below, is a very rare survivor, though there were likely hundreds made in the 1960s. Merchandise racks are routinely supplied to retailers to encourage both consumer purchase and reordering by retailers. 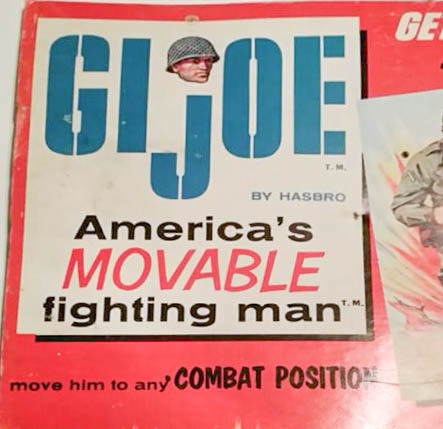 This GI Joe example is very large at over six feet tall and more than three feet wide, and remarkably still survives with its original shipping box, header card, and instructions. The metal shelving and pegs are painted an appropriate shade of olive drab. Nearly all of these displays were thrown away at the end of their useful life. 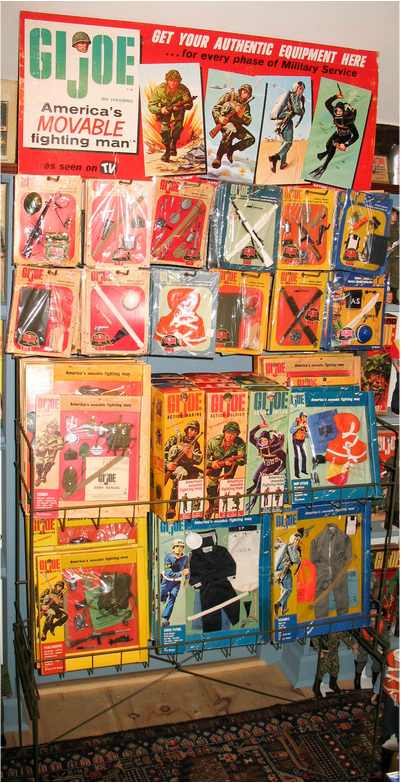 The 1968 photo boxes, 1969 Adventures of GI Joe line and Adventure Team items do not fit neatly on the rack, making its effective display years from 1964 through 1967. This example likely dates from late 1964 or early 1965 based on the header card. See details of first and second variations below. Above, the large shipping box for the rack, with a detail of its label. Below left, the rack nested in the box. 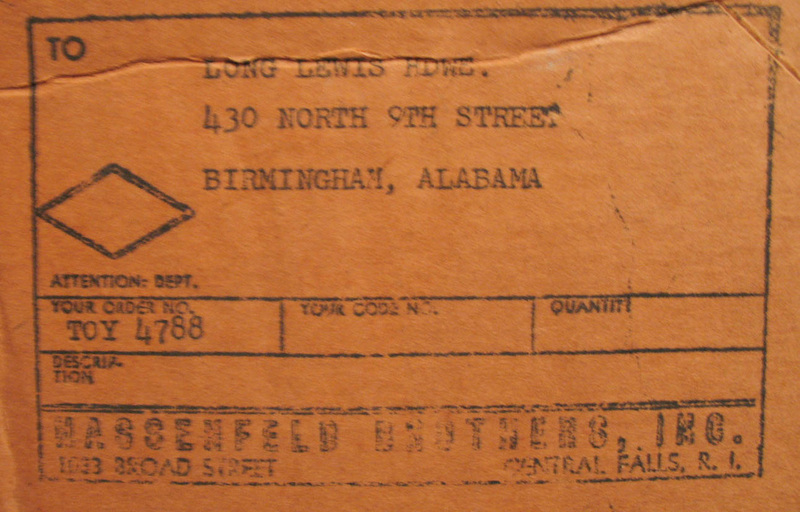 Below right, Hasbro's shipping stamp addressing the rack to Long-Lewis Hardware in Birmingham, Alabama. 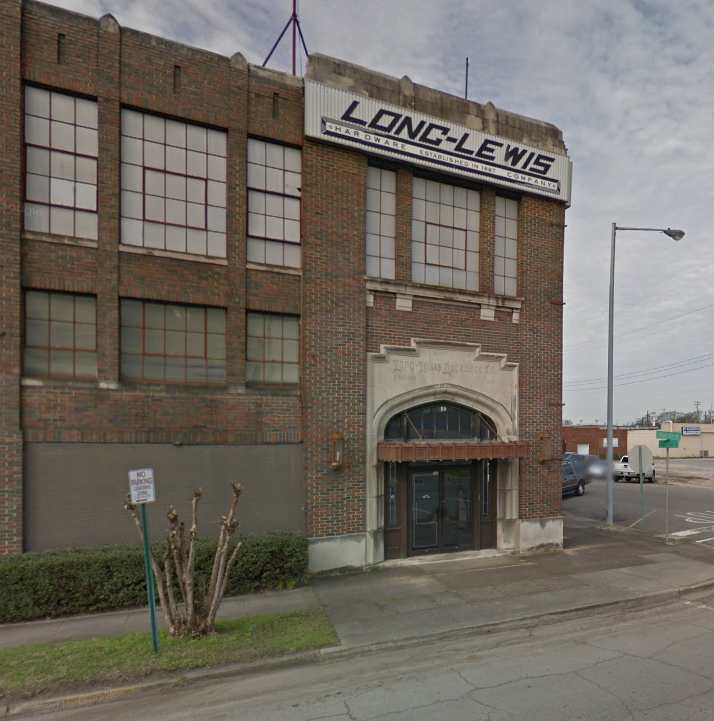 Left and below, the Long-Lewis building and doorway. The store closed its doors in late July 2015 after being bought out. Why the rack was never set up is a mystery, but it was left in its box for many years until being found recently. 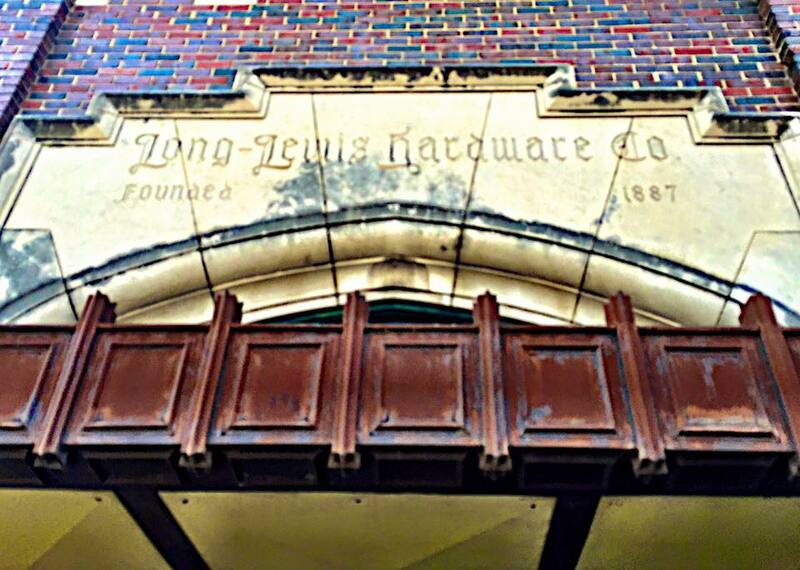 Images courtesy Google Streetview and the Long-Lewis Hardware Facebook page. Above, the header card form the boxed rack. Surface wear is from rubbing against the interior of the shipping box. Below, another example of the header, likely dating a few months earlier based on the language under the GI Joe logo. Image of lower header card courtesy of Joezeta. Right, a screen capture from one of the early GI Joe commercials, available to watch here. Child actor Paul O'Keefe enthuses over a header card like the one above. Below, details of the two cards. 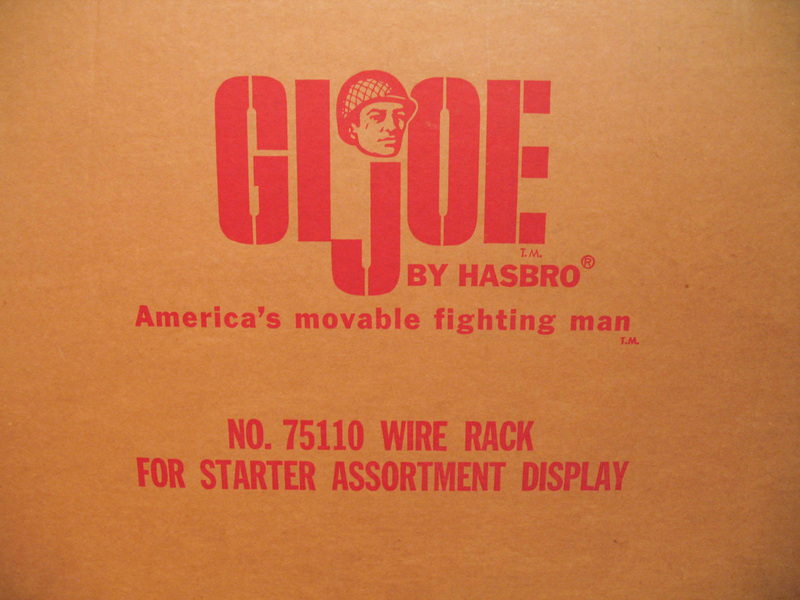 The earlier features the GI Joe logo in blue and the phrase "move him to any combat position." The second card has the logo in green and attempts to capitalize on Hasbro's television commercials. The cards probably date within a few months of each other. It has been suggested that the blue is actually a faded version and was also originally green. 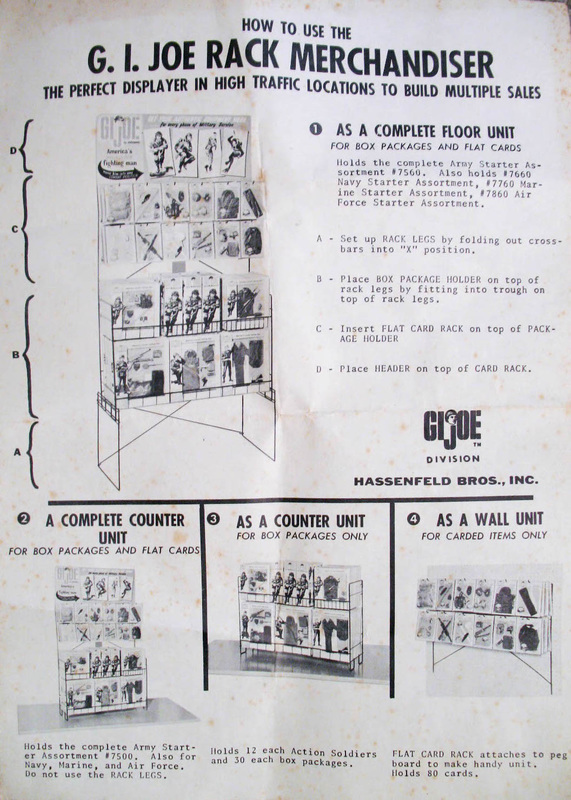 Above left, the back page of the 1964 retailer catalog featuring a prototype display rack with a different header. The image is enlarged below for easier reading. Above right, the instruction sheet from the merchandiser. Note that while the header matches that of the prototype, the rack itself is identical to the extant example above. The boxed soldiers on both racks are salesman's sample types. ​Like most manufacturers, Hasbro offered vendors a number of different display options. 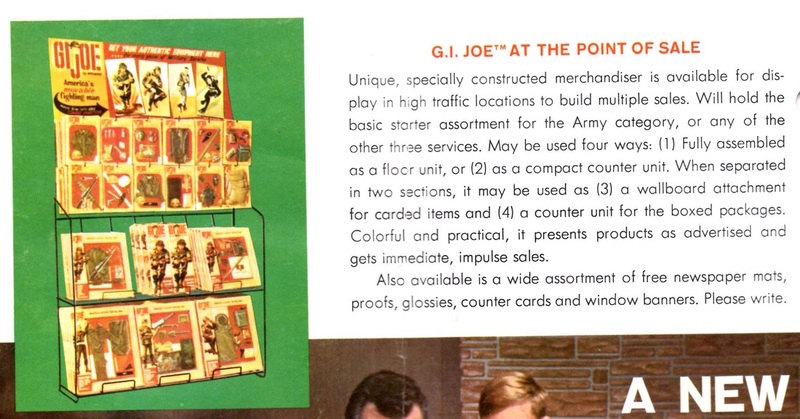 Above, what is likely the top half of a wire pin rack for mid-1960s era accessory cards. It is made to fit into standard peg board. Image courtesy of Matt Babek. ​To the right, the same rack loaded with beautiful sailor cards. Image courtesy of Kirk Robinson of California. 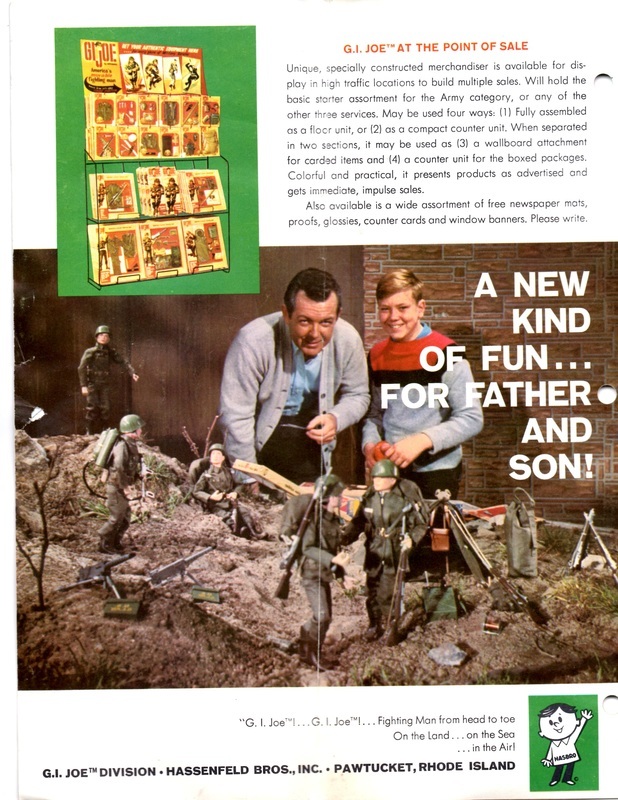 Collector Ray Thompson shared this great page from a 1965 issue of Playthings magazine. Besides the cool single and triple spinner racks, note incredible cardboard countertop standee with the four basic figures displayed in it with gear. If anyone has evidence of any of these displays, please contact me! This great metal store display sign is the Belgian version of the US sign shown above. The text is in French and Dutch, and the sign is on heavy gauge metal. An incredibly rare item shared courtesy of Todd Chamberlin. See his items for sale at Toychamber.com!